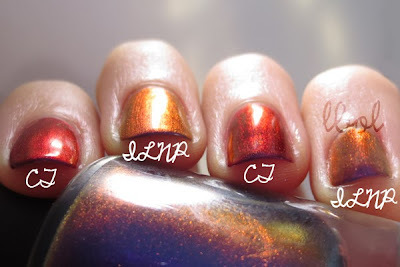 The first time I saw a swatch of Indian Summer I was OBSESSED. 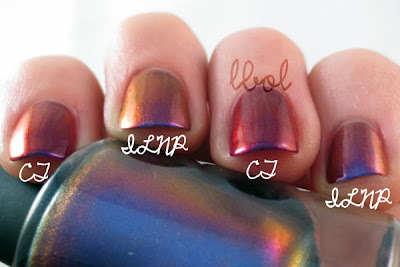 Multichromes are my jam, and it looked unlike anything I had in my (mostly unimpressive) collection. However, upon receipt, it instantly reminded me of Cygnus Loop. The differences are apparent right from the bottle, though. I had hastily thrown Indian Summer onto my swap board for about a week in a frenzied effort to get a hold of polishes I really wanted. I took it off right after swatching, ha ha. I need both, the end. 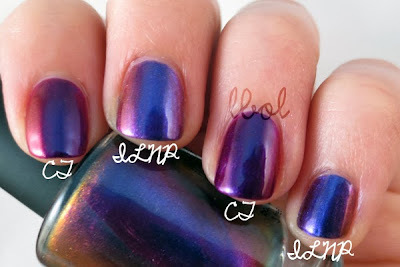 These are 3 thick-ish coats with Essie Good to Go on top. Artificial light, all of 'em. You'll immediately notice the difference in the range of shift. I mean, these pretty much don't look like they're even in the same, like, class together at this point. Indian Summer shifts violet through magenta, red and stops just short of orange while Cygnus Loop goes right on through to bright gold. I guess I should mention that in darker lighting, the difference really is pretty small. But that's irrelevant, because duh. What a great comparison! 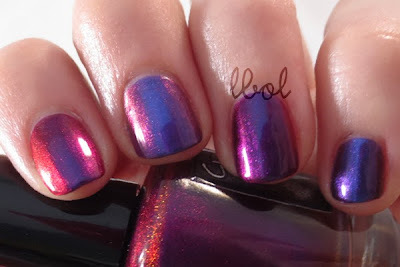 I love Indian Summer, how it's so rich and pigmented on the nails and that wonderful red shift it has. 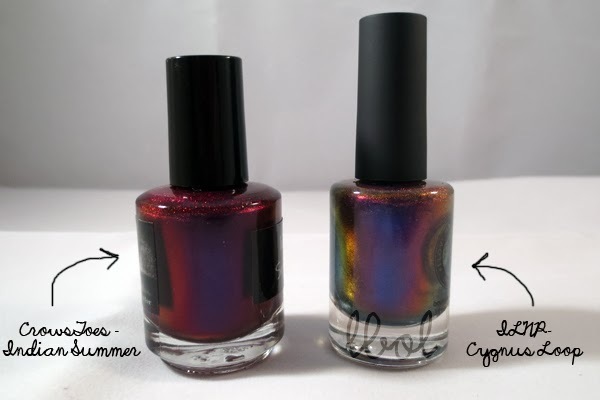 I don't have Cygnus Loop, but I did wear Indian Summer together with Birefringence as a gradient and the thing I noticed most was how much more sort of metallic the colours in the ILNP are compared to the jelly-squishiness of Indian Summer. I definitely think there's room for both of these in any collection! Thank you! I couldn't quite place how the two were different besides in color shift (embarrassingly...). That gradient sounds amaaazingggg. I'm super happy I didn't end up swapping it. Would have had swapper's remorse for sure! I sooo want Indian Summer!